"Michael Roman and the crew did a great job." This is a unique before and after, in that the before picture was taken inside of the home and the during/after shot is from outside in the excavated soil. We were called out to this home after the owner noticed that water was leaking in. He had built the home himself and knew right away what the problem was. The hole in the wall where the sewer pipe entered the basement had turned into a leak for ground water. Uninterested in building an entirely new wall, he decided to give Ayers a call for help. After discussing possible fixes with the homeowner, the team came up with an idea for a solution that was part interior and exterior. The inside cracks would be sealed over with FlexiSpan, a sealant designed to flex with wall movement without washing away. Since the water was flowing from outside, it was important that a barrier be put over the exterior cracks. Sentry Seal is a crack repair product installed once soil has been excavated away from the foundation. The waterproof membrane was put in place over the crack on the exterior side and will stand up to ground water, soil, and whatever else the elements throw its way. This basement will now stay as dry as it would with a brand new wall but without the lengthy and costly installation. A family in Cassoplis, MI began to notice their energy bills going up and thought it was because of their unkept crawl sapce. After receiving their call, we arrived at the house and found the problems that were causing the family issues. First, there were small gaps between tiny seams and cracks in the wall that air flow was passing through. Spray foam insulation was used to seal up those hard to reach places that traditional fiberglass cover could not reach. Next, we protected the entire crawl space with CleanSpace. CleanSpace is our vapor liner used to keep moisture and mold out of a crawl space area and can be seen in the after picture below as the white, durable liner. The final touch on this project was the instullation of SilverGlo. These are insulation wall panels that are used to keep the crawl space dry, the house warm, and the energy bills low. I have water pouring out of my basement wall, flooding my basement. Tried to get a plumbing company to check it, but they say it's a problem with the foundation. Some of the cement bricks in my basement are pushing outward, while others are pushing in. If you stand back far enough you can see outside from my basement. Before we put up a tarp outside, our basement would flood every time it rained heavily. Water is seeming to leak in from some of the other walls too, as well as where the hookup from my well comes in. We plan on fixing it ourselves, but if we can get some professional eyes on it and the cost isn't more than we can handle we would consider getting it professionally fixed. Interested in purchasing a Fannie Mae foreclosure that needs foundation repair. Would like a second showing with expert in foundation work to give quote on repairs for negogiating and will probably use this specific company giving quote for repair when home is purchased. We are looking to get our basement finished this year, and would like to have the basement waterproofed before starting any framing work to it. It is a walk out basement, 3 sides are poured cement walls. We need a quote for a Michigan basement that has 1/2 cement block & the rest is dirt. Michael Roman and the crew did a great job. The guys did their jobs and were great. It was a lot of work, Terry was wonderful in organizing with Wyatt's help. I like your salesperson James Snyder. Your pricing is high but quality of work is there for the price. You should look at giving a longer warranty on sump pump and dehumidifiers. I am very happy with how the project turned out. 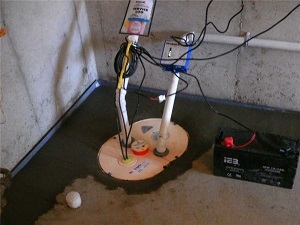 A sump pump we installed with a backup battery in Michigan. If you're looking for a basement waterproofing contractor dedicated to using the latest technology to permanently solve your basement's issues, you've come to the right place. Ayers Basement Systems has been serving the basement and crawl space needs of homeowners in Cassopolis ever since we opened our doors in 1981. Basement water problems and cold, damp crawl spaces only lead to long-term hardship for your home, so it's best to take care of these situations sooner rather than later. Once you've determined that you might be facing a problem, calling in the professionals at Ayers Basement Systems is the next logical step. Otherwise, you'll be dealing with a wet basement that will only get more expensive to fix as the years go on. Our fully trained and skilled basement waterproofing specialists can find the source of the issue and come up with the solution best suited to your needs. If you're suffering with sump pump problems, we have a line of proven, patented pumps that can handle any volume of water that comes into your basement. We also have a wide range of other basement waterproofing products, including French drains, dehumidifiers, water heater rings, washer hoses, and even waterproof basement flooring and wall options. All of these products, developed by Basement Systems, can help keep your basement drier and more comfortable. In addition to our basement offerings, we can also solve similar problems in your crawl space. Crawl spaces are unique because they are usually much more susceptible to the air outside, and they are also far more neglected than a basement. However, crawl space moisture can just as easily lead to uneven temperatures and mold in your home. Ayers Basement Systems offers crawl space encapsulation and repair services to ensure your home is protected from these eventualities. Our crawl space vapor barrier can prevent cold, damp air from entering your crawl space, and it will also prohibit mold growth and decay. If your walls are coming apart from your ceiling, you might have foundation settlement. Do you have a faulty foundation? As the base for the rest of your home's structural integrity, it's crucial to ensure that your foundation is supported as well as possible. Sometimes, this is easier said than done. The soils around your home might not be well-suited for bearing heavy loads, so it's up to foundation repair specialists like Ayers Basement Systems to restore your foundation and save you money in the long run. Ayers Basement Systems can solve these and other issues using high-quality foundation repair products. As a part of the Foundation Supportworks dealer network, we have access to products specifically designed for foundations by structural and geotechnical engineers - leaders in their fields. We can stop foundation settlement in its tracks and oftentimes lift your foundation back to its original position, removing cracks and uneven floors. We can also use wall anchors to restore bowing walls, or crawl space support posts to lift a sagging crawl space floor. No foundation repair job is too complex for our talented teams! We also offer concrete lifting and leveling services using PolyLevel. Over time, the weight of a concrete slab can cause it to sink, creating cracks and bumps in your driveway, sidewalk, pool deck, and more. PolyLevel is a lightweight polyurethane foam that is injected beneath a sunken concrete slab and expands, lifting the concrete to its original position. A much better alternative to mudjacking, PolyLevel will help make your property safer and restore its curb appeal! Are you in need of any basement waterproofing, crawl space repair, foundation repair, or concrete leveling services? Ayers Basement Systems has the experience and the tools needed to make your home improvement project a success. We've helped many of your neighbors in Cassopolis, and we look forward to making your home a better place! Schedule a free estimate with us today! This customer called because she was looking to restore her failing basement foundation wall. The full basement was built over 50 years ago at the time and there were many cracks between the blocks that were concerning the homeowner. We used the effective PowerBrace system to stabilize the failing wall and prevent it from continuing to shift and crack over time. This system used strong, steel I-Beams that were installed in the floor at the base of the home and ran up the entire height of the basement wall. The top of the system was secured to the joists above the wall with steel brackets and tightened into place to completely stabilize the wall. I have had a wet basement for years and am thinking of having it taken care of.